I miss Obsidian. I think Olympia — the world even — was richer with it in it. Waffles and hot dogs served in a Scandinavian black metal-themed locale? I guess it wasn’t wont for this world, and its owners’ decision to transform the spot from a café into a club clearly didn’t pan out for long. Now Octapas has opened its doors in the building, and the result is a bit of a mixed bag. The vibe is good, and I’m glad the wood paneling still dons the bar. It’s all reminiscent enough of Obsidian to keep the memory alive, yet it’s still its own thing. Looking at the menu, things are less intriguing, and it’s hard to say what Octapas is trying to be. It’s not very downtown Olympia, with a dearth of vegan dishes, and not a whole lot in the way of vegetarian offerings either. If you’re not into eggs, your non-carnivore brunch options are limited to a couple of side dishes. 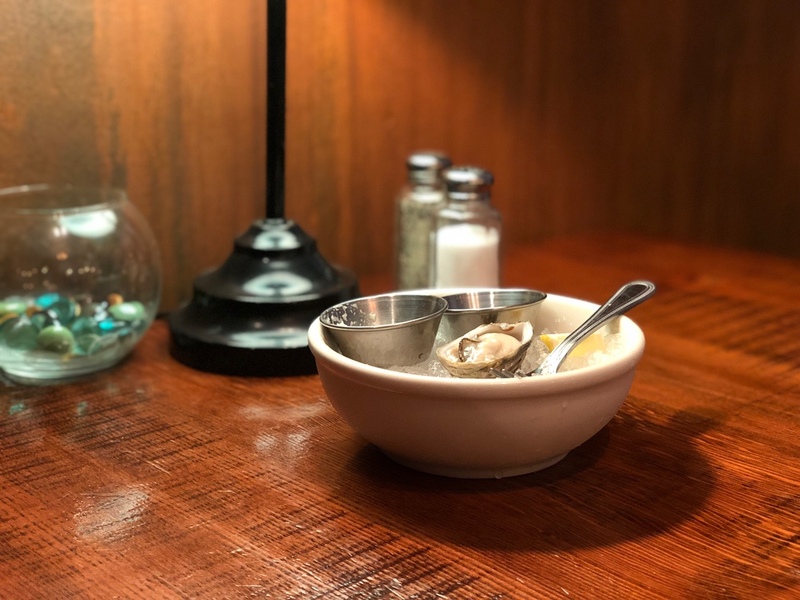 The rest is not particularly original, either, and aside from a selection of oysters — always welcomed — the menu is more Lacey than Olympia. No offense to Lacey, but… Well, you know. Different market for sure. The aforementioned oysters weren’t bad at any rate. From Hood Canal, they tasted fresh, and the accompanying horseradish was spicy. The $2.75 a pop price point is OK, though $15 for half a dozen doesn’t seem like too great of a discount. Going with a carnitas breakfast burrito the day after the religious awakening at La Tarasca might not have been a great decision, but it was done in the name of science. It wasn’t a bad burrito either, just… regular. Completely average. The carnitas were decent, with a nice chew and all that, but not memorable. Should you go to Octapas with a group, you know you’ll have a safe choice, and frankly, a group decision is the only reason we’d go back, as opposed to our own sole choice. But I’m getting ahead of myself. The beignets were fine — lightly fried, and covered with powdered sugar as one would expect. They didn’t have any distinct flavors, and probably wouldn’t transport you back to New Orleans. Still, yet another safe choice. Because Octapas is safe. There is nothing offensively bad there or even bad in general. Maybe that is why the colorful locals of yore are nowhere to be seen. During our final visit to Obsidian, people were sleeping at the bar by the window; this time there was more of a, shall we say, subdivision vibe. Which is fine. We just miss what once was, and what was once served. Octapas is no Obsidian, and I suppose we’ll have to get our Dimmu Borgir and waffles at home instead. Do you recommend Octapas Café ? Make your voice heard!